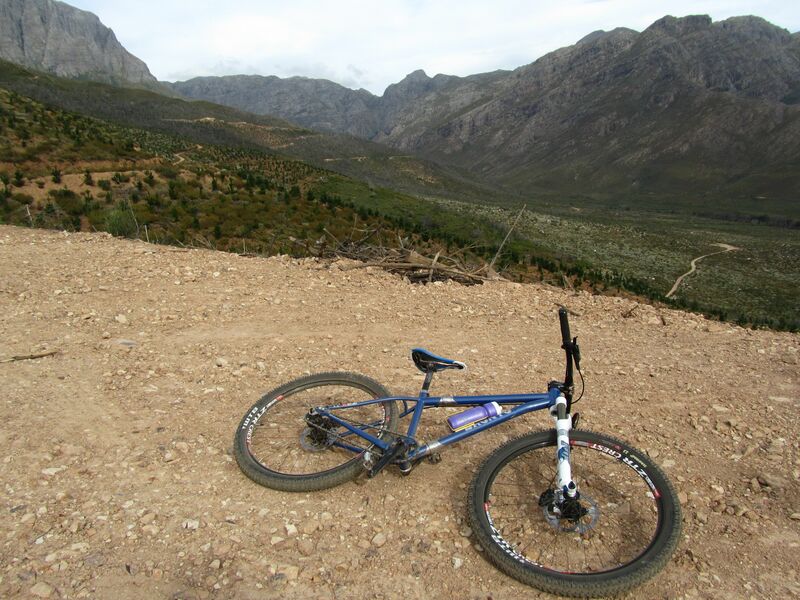 Jonkershoek is gorgeous. Majestic and jagged mountains behind us, the trails were well-maintained. We stopped at a trail map and noticed that there had been a forest fire. We found a piece of pretty amongst the charred remains of plants. 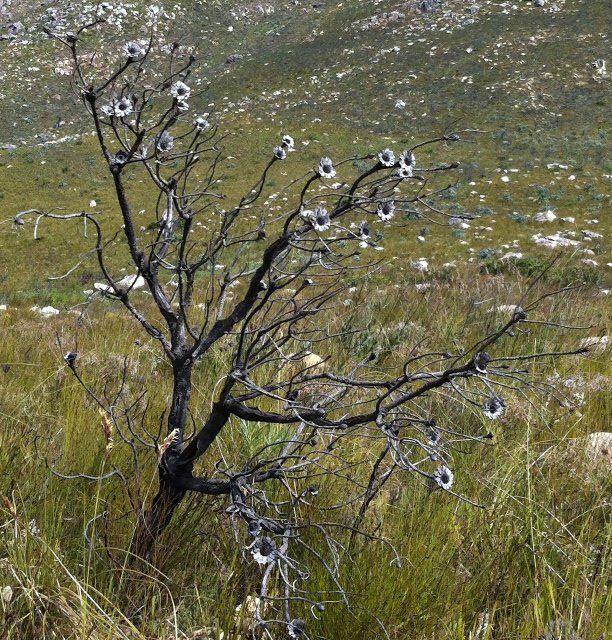 A charred tree with daisies growing on it. 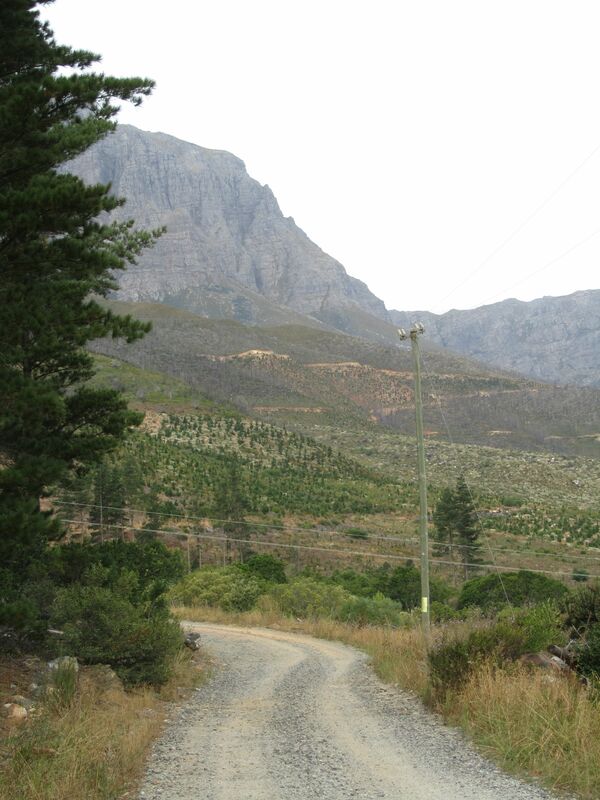 Jonkershoek has a lot of climbing up jeep roads. It’s not treacherous, it’s just difficult on a single-speed bicycle. I walked several sections and was fairly far behind my two companions (they were ready for the biggest race of their lives, remember?) and so I enjoyed quite a bit of scenery riding solo. After climbing up a ways, the road curved and kept going up. This was a look out I set my Bronto at to take a sweet scenic picture. After a little more climbing, we came across some timber harvesting and finally found the trail sign for single track. 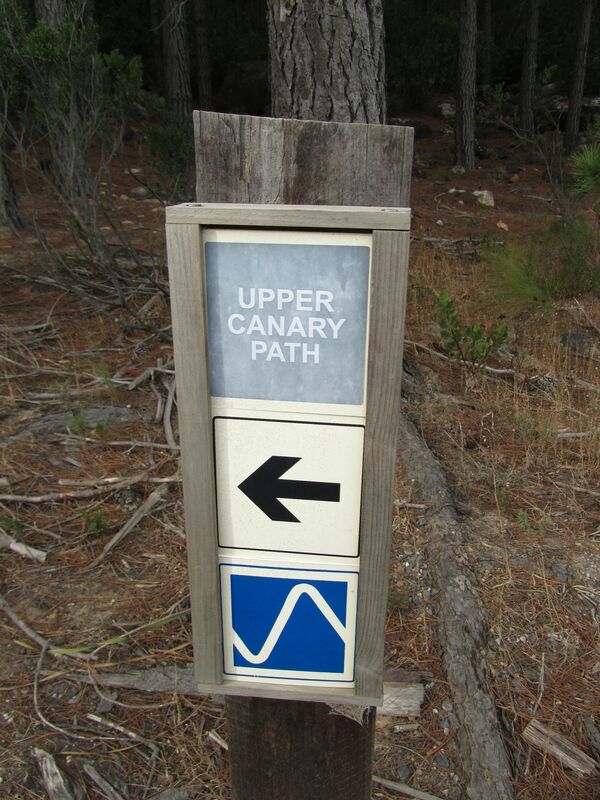 We turned onto the Upper Canary Path and…climbed UP single track. At this point, my legs were pretty shredded and the humidity was killing me. We ran into a local guy who had just come from the top on a fun day ride run. WHAT?!? Yea. You can go to the top of those CRAGGY mountains. No way I was doing that today. I’ll admit, the whistles and hollers from the timber workers was an energy booster but I wasn’t even near equal with the physical prowess of Josh and Jackie. And so I trucked along with my mouth hanging open half in awe of muscle dude who killed the mountain and half in need of a cold beer. We finally made it to the start of the trail, turned around, and started heading back down. I hate doing that. I’m a looper kind of rider. I don’t want to go there and then have to come ALL THE WAY BACK. But…it’s always amazing to me how, upon the start of a descent, all that uphill all of a sudden feels worth every second of agony you had for the last two hours. A smile broke out on my face and I started cruising downhill and pumping through the track as fast as I could. At the trail’s end, we came back to the dirt road. Heading back down the road to dinner. As the sun was starting to hide itself behind the trees, we headed down the road to the visitor center. Past the gates and out onto the paved road, we were all in good moods. 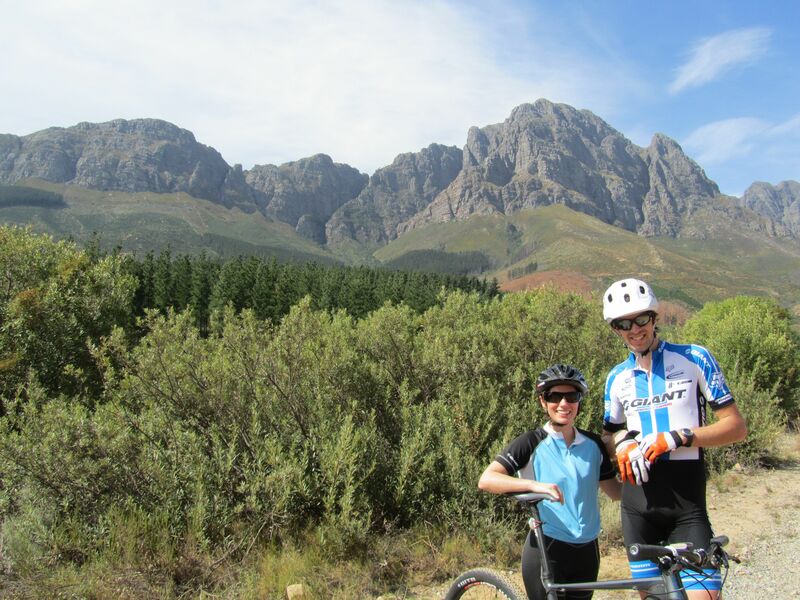 Having shaken our legs out, gotten a good single-track session in, and worked up an appetite, we headed back into town. 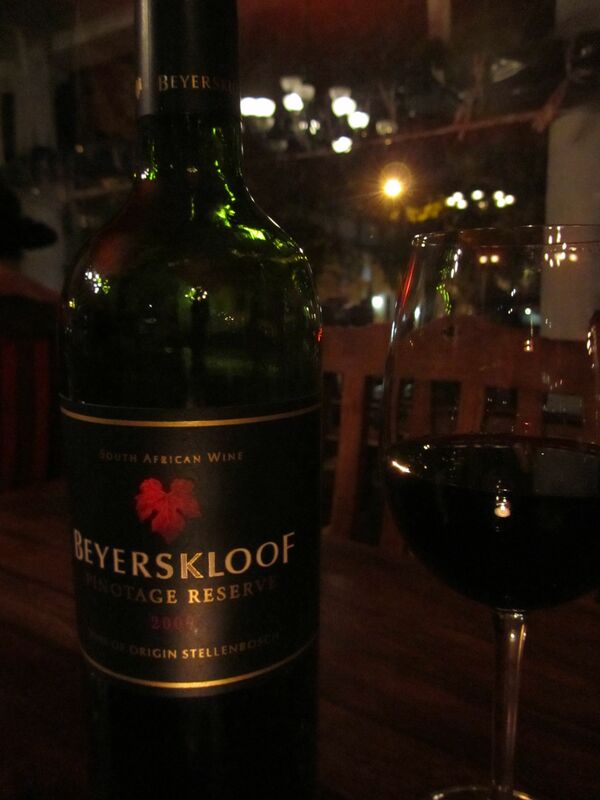 We found a great spot right on the main street…and had a delicious bottle of South African (local Stellenbosch) red wine and Indian food.